US Secretary of Defence James Mattis arrived on a two-day visit at New Delhi on September 25 to hold talks with Defence Minister Nirmala Sitharaman. He is the first cabinet rank official under the Trump administration to visit India. Ahead of his visit, Mattis had stated that stronger military ties between India and the US should not affect relations with neighbours such as Pakistan. He had also lauded India for contributing tens of thousands of dollars for building infrastructure in Afghanistan and training Afghan officers, saying, "They've been a great asset, and we would see them continuing along the lines they have already chosen, and looking for any other areas that they may believe appropriate to the relationship with Afghanistan", adding, "No nation has probably contributed more bilaterally than India in building that hope." On arrival in India, Mattis remarked, "This is a historic opportunity for our two democracies at a time of strategic convergence." On September 26, James Mattis called on Prime Minister Narendra Modi, held delegation level talks with his counterpart Nirmala Sitharaman followed by both addressing a press conference, and also laid a wreath at Amar Jawan Jyoti at India Gate. 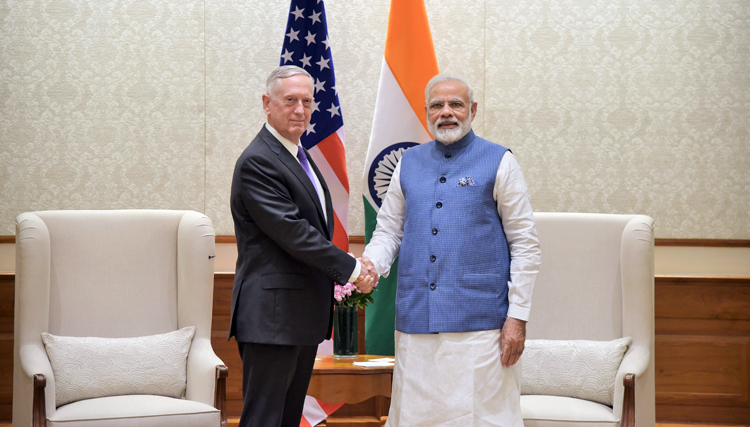 In his meeting with PM Modi, Mattis briefed him on on the progress in advancing the bilateral agenda and implementing the decisions taken during Modi's visit to the US. Enhanced cooperation between India and the US, regionally and globally, in pursuing shared priorities for peace, stability and combating terrorism were discussed between the two. The main focus of the visit by Mattis included: deepening military ties; potential sales of US jet fighters; moving forward the $2 billion deal to supply 22 Sea Guardian drone aircraft to the Indian navy that the US government approved in June - first such clearance to a non-NATO ally; signaling China and Pakistan Indo-US cooperation in freedom of navigation on high seas, Global Commons, and in fighting terrorism. Sea Guardian are state-of-the-art maritime reconnaissance drones crucial for maritime security, which is common interest to both India and the US, due to Chinese submarines aggressively crisscrossing the Indian ocean. Prior to the Mattis visit, our media had speculated on following aspects that would likely come up for discussion: US policy towards Afghanistan; India's help to Afghanistan since Prsident Trump's call to "help us more with Afghanistan, especially in the area of economic assistance and development"; inking deal of sale Sea Guardian drones; proposal to manufacture the F-16 and F-18A under 'Make in India' along with identifying new projects under the Defence Technology and Trade Initiatives (DTTI), and; taking the relationship to the next level, including more military exercises and sale of high-technology defence equipment. Defence Minister Nirmala Sitharaman during her talks with counterpart General James Mattis discussed key bilateral, regional and international issues, including terrorism emanating from Pakistan. The issue of US assistance to Pakistan was also reportedly brought up by Sitharaman. Later at a joint press conference, Defence Minister Nirmala Sitharaman ruled out India sending troops to Afghanistan saying, "There shall not be any boots on ground from India". She reiterated that India will continue its developmental and medical assistance to Afghanistan. Post, the unveiling of his new Af-Pak policy by Trump, Indian media was abuzz with speculation about India sending troops to Afghanistan. But the fact is that Afghanistan never asked for Indian troops and unlikely US asked for same. Nirmala Sitharaman said that Indo-US defence ties have grown in recent years and emerged as "key pillar" in strategic partnership with last year US acknowledging India as a major defence partner, adding "Mr Mattis and I also discussed transfer of technology for various projects." James Mattis said, "We value India's invaluable contribution to Afghanistan and welcome further efforts to promote Afghan democracy, safety and security", adding, "We appreciate India's leadership in the Indian Ocean and seek to work together to build a resilient regional architecture." Very significantly, Mattis said that the administration of President Donald Trump will no longer tolerate terror safe havens anywhere in the world, adding, "There can be no tolerance of terror safe havens, as global leaders, India and US have resolved to work together to eradicate this scourge." Calling terrorism a common problem affecting the two countries, Mattis said, "Our two countries recognize the threat that global terrorism poses to people throughout the world." The joint statement issued after meeting of both defence ministers called for India and the US to come together to combat the scourge of terrorism. The manner in which Trump's new Af-Pak policy will translate on ground will also be significant to watch. The US has increased the number of F-16s in Afghanistan already, indicating its resolve to go after the Taliban and Pakistan-supported proxies fighting in Afghanistan In an unannounced visit US Defense Secretary Mattis arrived in Kabul on September 27 along with NATO Chief Jens Stoltenberg, as the US boots on ground are being increased, and with Pakistani army chief scheduled to visit Afghanistan in October, while some 20 rockets landed near Kabul international airport sometime after arrival of Mattis. Maritime security and peace in the broader Indo-Pacific, and counter terrorism are shared objective of both the India and the US. This partnership is crucial to peace and stability of the region and needs to be elevated to higher levels continuously.